Did you know that women hold only 24 percent of ICT jobs worldwide, and make up only 32 percent of STEM (science, technology, engineering and math) graduates at universities? The technology gender gap stunts women’s earning opportunities, industry’s productivity and creativity, and society’s overall well-being. (Left to right) Dell Chief Responsibility Officer Trisa Thompson, Girls Who Code Founder and CEO Reshma Saujani, and STEM advocate, author and student Quinn Langford. 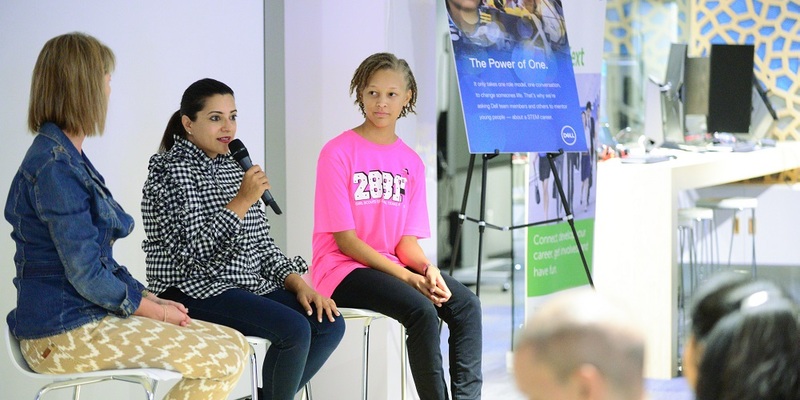 Last month, Dell’s Employee Resource Group for Young Professionals, GenNext, hosted a dialogue with Dell Youth Learning partner, Girls Who Code, to discuss challenges within STEM education, the power of mentorship and how we can engage more girls and underserved in technology education. “The future belongs to those who can build digital technologies — and those who can use them to solve problems,” said Marius Haas, president and chief commercial officer of Dell EMC. Powerful words spoken by Marius Haas as he welcomed over 60 attendees in the Dell Experience Lounge in Round Rock, Texas. At Dell, we spend our days thinking about the future of technology and how digital transformation is radically transforming every aspect of the global economy. However, to fully realize this future, we also need to ensure the next generation is prepared and engaged with technology and STEM fields from an early age. In fact, K-12 female students’ achievements in math and science are on par with those of their male peers. But girls’ interest and participation in STEM education—especially computer science and engineering—ebbs over time, with the biggest decline happening between the ages of 13 and 17. 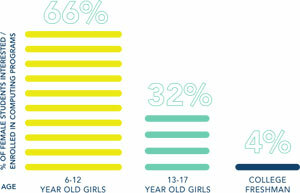 According to Girls Who Code, 66 percent of 6- to 12-year-old girls are enrolled or interested in computing programs, but interest levels drop to 32 percent among 13- to 17-year-olds. The pipeline of female STEM talent continues to “leak” over time, shrinking between high school and college, college and the workforce, and between all levels of the corporate ladder. Only 1 in 7 women with a STEM degree actually works in that area. “Efforts of Employee Resource Groups like GenNext are so critical to ensure we inspire the potential of the next generation to develop and advance their careers at Dell,” said Haas, highlighting one of multiple efforts Dell does in this regards. He invited Dell’s Chief Responsibility Officer, Trisa Thompson, to the stage who led a panel discussion with Girls Who Code founder and CEO, Reshma Saujani, and 15-year old STEM advocate, author and student, Quinn Langford. The three discussed the issues facing girls in STEM, how Dell empowers girls, and ways Dell team members can participate in their advancement. Saujani began her career as an attorney and activist before she surged onto the political scene as the first Indian American woman to run for U.S. Congress in 2010. During the race, Saujani visited local schools and saw the gender gap in computing classes firsthand. She kept asking herself “Where are the girls?” which led her to start Girls Who Code. 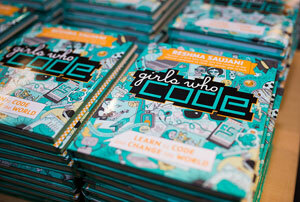 “Innovation is left on sidelines when we don’t teach girls,” Saujani stated passionately. What started as an experiment has grown into a national movement. Girls Who Code has gone from 20 girls in New York to 40,000 girls in 50 states. That’s the same number of girls who graduate each year with a degree in computer science. They achieved this success by two program components: After School Clubs for 6-12th grade girls and a 7-week Summer Immersion Program for 10-11th grade girls. Dell is a national sponsor of the after school Clubs, which are located at a variety of places – from homeless shelters to Indian reservations to the best public and private schools. Girls who have gone through either program are more likely to consider studying Computer Science in college. Thompson and Saujani were also joined on stage by 15-year old Quinn Langford. One could say ‘a superstar in the making’ but she already is a superstar. Next to being a student, Langford is a STEM advocate, author of the book, a member of the Girl Scout’s all-girls Lady Cans Robotics Team, and potentially a future nanotechnologist, an area she’s particularly interested in. In 6th grade, she became a member of the Lady Cans and later she co-wrote a book “Embracing STEM Smarts” to encourage young girls to follow their passion. Talk about a role model! Langford seconded the need for more corporations to sponsor programs and offer mentorship for girls to feel comfortable and have means to get in touch with role models. Speaking of books – while being pregnant, Saujani worked on a non-fiction book for girls highlighting real-life stories of girls and women in STEM. On the cover it says “Learn to code and change the world”. The more women we have working in tech, the more role models and mentors we’ll have for the next generation. With this in mind, Saujani has published a series of 13 books – the first two of which were instant New York Times best sellers – featuring girls and women from different backgrounds and their journeys and novels of success. “Every girl in this country can find herself in one of the girls in the books,” says Saujani. She hopes to change the stereotype of what an engineer or computer scientist ‘should’ look like. Although she is in an all-girls robotics team, some others are co-led between girls and boys and she noticed differences in what the girls are tasked to do, e.g. they don’t drive the robots or speak up as frequently. On another occasion she recalled that some members of her team wanted to help out at an event and got turned away as the job “is heavy lifting and this isn’t something for girls.” Omph. It’s clear that there also needs to be a change in the education system. In the meantime programs like Girls Who Code or Girl Scouts robotics teams are needed to intentionally give girls the opportunity to experience coding, timbering, fixing things, and most importantly a safe place to learn how to fail. Adding to this, she shared: “I used to hand over difficult tasks to my husband to fix. And that’s not okay. I’m not a good role model for my child. Now I ask for instructions and help but do it myself.” Children mirror what they see. Storytelling is a powerful force for empowering young people to study STEM. On International Day of the Girl (October 11), Dell is calling on technology leaders, its own team members and others in the industry to support the Power of One Mentor initiative – talk to one child about what you do every day, why you love it, and how it makes a difference. Just one conversation can have a lasting impact and set a child on the course to change the world. Learn more about the Power Of One Mentor initiative. Join the conversation and share your stories using #PowerofOne. I don’t know about you but I feel energized to support girls far and wide to become whatever they dream of. There is a little trailblazer in all of us. Let’s support each other and change the world! You can also read more on Direct2DellEMC about how Dell is “Cracking the Code” to make a difference for the next generation of women in STEM.